This leek soup swims upstream. 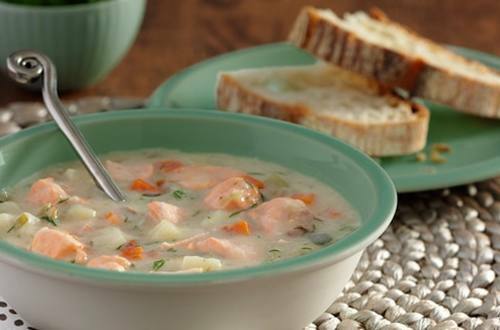 Our Salmon Leek Chowder soup recipe improves the typical potato leek soup with salmon and bacon. Grab a spoon and dive in. 1 Cook bacon until crisp in large saucepan. Remove bacon and set aside; reserve drippings. 2 Cook celery, carrot, potatoes and onion in reserved drippings over medium-high heat, stirring frequently, until vegetables are tender, about 10 minutes. Stir in water, milk and Knorr® Leek recipe mix. Bring to boil. Reduce heat to low and simmer, stirring occasionally, 5 minutes. stir in salmon, until salmon flakes with a fork and vegetables are tender, about 5 minutes. Stir in parsley and reserved bacon.